Trump | Just something I was thinking about . . .
Just yesterday, he ordered 350 more gold-plated Cross pens (made in China) because he has already handed out, after one use I might add, 150. My dad was in the service my entire childhood & the pens they used then & the ones government employees use now are Skilcraft – which by the way are made by blind and disabled Americans here in America. Being somewhat of a pen/pencil connoisseur, I can tell you they write just as a good as a Cross. When we are trillions in debt, in all honesty, why are we wasting pens? Sometimes tradition has to go by the wayside when times are tough . . . I know this first hand & most recent. Every little thing adds up. I used to work as a purchaser for the government & I also know when you are given a budget & you don’t use it all they reduce your budget the next year – so you are encouraged to spend your money whether you need to that year or not – which is crazy. Think about it – if we all did that, we’d never have anything saved. Just seems so wasteful to me . . . The President also said the media was an enemy to the people of this country. He only likes media outlets that toot his egotistical horn. How dangerous his statement is – if you don’t feel it . . . it’s dictator-speak. Not unlike that of Stalin and other “leaders” who were destructive and evil in their throne of power. I am a trained journalist. I fact check (through several different reliable sources) statements of fact that I write about, regardless of my own opinion. I believe in the power of journalism – NOT fake news or alternative facts, but true unbiased fact sharing journalism. There are still true journalists out there reporting the facts, even if you have to seek them out. So I say again . 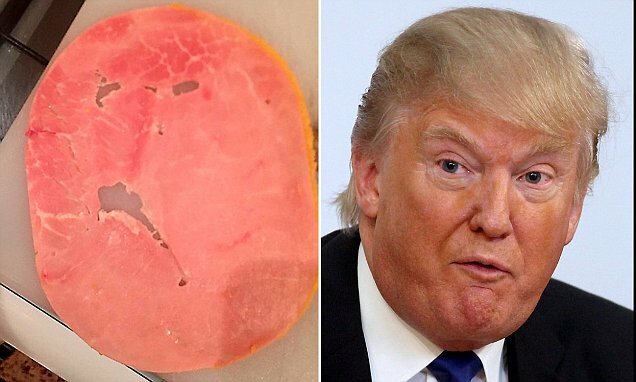 . . President Trump is a ham, and too much ham will always cause bloat and discomfort and could lead to other more serious issues . . .